Have a quick glance at the Tiger Woods 2018 British Open odds and it’s immediately noticeable that the long-time former world number one is ranked much more favourably than at most recent majors. Woods is priced up at 22/1 in the outright tournament winner betting, with only seven players finding themselves at shorter odds to win the Open. This is Woods’ first Open appearance since 2015 and there are plenty of reasons to be optimistic about his prospects as he bids to win a 15th career major and a fourth Open title. His last Open win came at Hoylake in 2006, when finishing two shots clear of Chris DiMarco. What was noteworthy about that specific Open was that the rain stayed away, the grass was significantly burnt and conditions were fast. To best manage the challenges such conditions posed, Woods only used his driver once across the 72 holes. Instead, he found a perfect partner in his two iron, which allowed him to find a greater number of fairways than was usually the case. What makes Carnoustie good for Tiger Woods 2018 British Open odds? 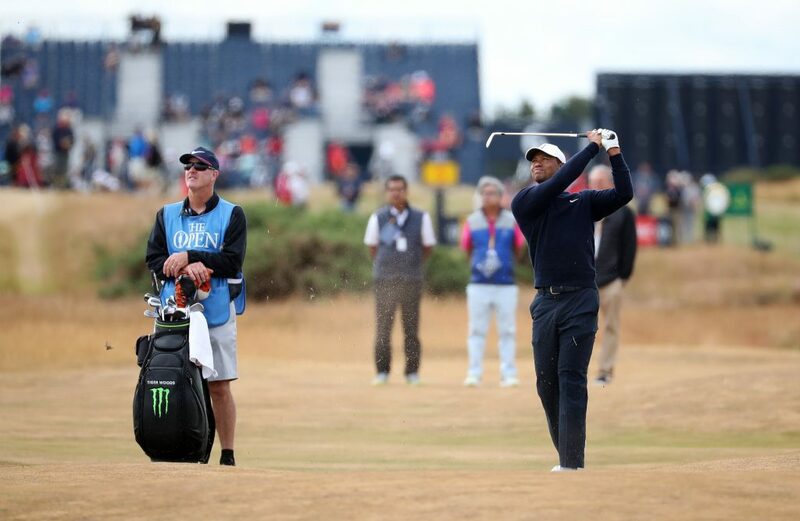 Woods will be tempted to adopt a similar strategy at Carnoustie this year as, although the course is 144 yards longer than Hoylake, there have been some monumental driving distances in pre-Open practice rounds. Woods said of the conditions: “Right now the fairways are faster than the greens. It is mainly about trajectory, that’s what is going to be important, how hot you want the ball coming into the fairways. Woods has been seen practicing with a new driving iron and it’s expected to feature in his Open bag, This could prove his most important club if the Tiger Woods 2018 British Open odds are to be successful. The fact that he’s the only player on the PGA Tour to currently rank in the top 10 in both strokes gained approach and strokes gained around the green could be pivotal too, especially if using an iron from the tee. Alternatively, it may pay to accept the 9/4 Tiger Woods 2018 British Open odds on a top-10 finish. This is the finish he’s likely to need at the Open to qualify for the upcoming PGA Tour event at Firestone Country Club, where he’s triumphed eight times. Only the top 50 in the official world rankings participate in the WGC-Bridgestone Invitational and Woods is currently positioned at 71 on this list. There are a collection of Tiger Woods specials available for the British Open too, which includes odds of 125/1 that he registers a hole in one during the tournament.